Footage from CCTV Cameras, Webcams and Baby Monitors has been hacked and uploaded to a Russian website. 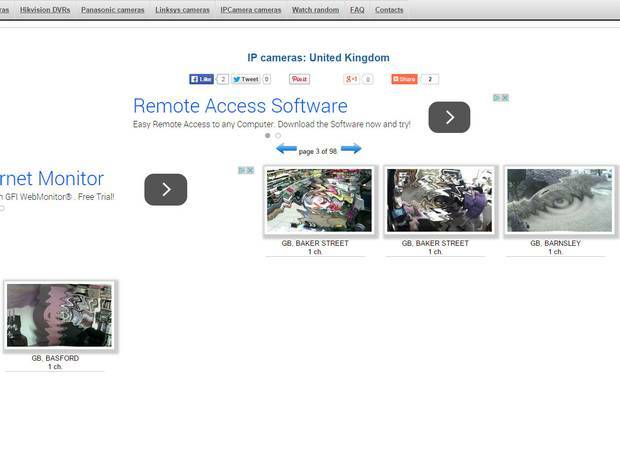 The data contains hundreds of live footages from UK homes and business. UK’s privacy supervisory body has advised people to update passwords after Russian website was found featuring 500 live footages from Britain. The site presently shows a gym in Manchester, an office in Leicester, a shop interior in London and what is believed a child’s bedroom in Birmingham amongst others. UK’s Information Commissioner’s Office (ICO) advised people from the UK to upgrade their passwords following the statement of Russian site’s administrator that the purpose of hacking is to highlight poor password practices and poor security and the footages will end after all cameras are all password protected. Christopher Graham, the UK Information Commissioner said he will be working with the Russian authorities to make the site down and the site will be illegal in the United Kingdom. He added that the footages that are collected from the security cameras utilized by public and businesses varying from CCTV networks to secure large areas, down to the built-in cameras from baby monitors. “This is a threat that all of us needs to be aware of and be taking action to protect against,” he stated. Information Commissioner’s Office advised people to make steps in securing their internet accessible cameras by changing passwords that could not easily guess containing characters, numbers, and a mixture of upper and lower case letters. ICO also advised people to check all the security settings available from their cameras and make sure all other devises connected to internet are secured. Russian site listed the feeds available for viewing in both device manufacturer and its country. BBC said that the usual listed webcams to get hacked is China-based Foscam, Panasonic and Linksys. Linksys spokesperson also explained that their newer version of Linksys show a warning to their users who have not yet changed their default password that is visible every time the user logs in to the camera. Lots of people are using their webcams to check their homes as they are away by watching footages using the internet. However, ICO could not stop hackers from uploading the footages from the Russian and other similar sites past the UK’s borders. Mr. Rice of ICO warned people the capability of these cameras to access the footages remotely is the biggest reason for a great selling point. However, if these cameras were not set up properly, possibly is the biggest security weakness too? He said “Remember, if you can access your video footage over the internet, then what is stopping someone else from doing the same?